That possibility emerged Dec. 1, when scientists attending the Gravitational Wave Physics and Astronomy Workshop in Maryland reported their detection of 10 binary black hole mergers and another involving colliding neutron stars. The neutron star merger and six of the black hole mergers had been reported previously. The events were listed in a first-ever astronomical catalog that collectively details multiple gravitational wave events detected by the National Science Foundation's Laser Interferometer Gravitational-Wave Observatory, or LIGO, and the Virgo laser interferometer of the European Gravitational Observatory near Cascina, Italy. 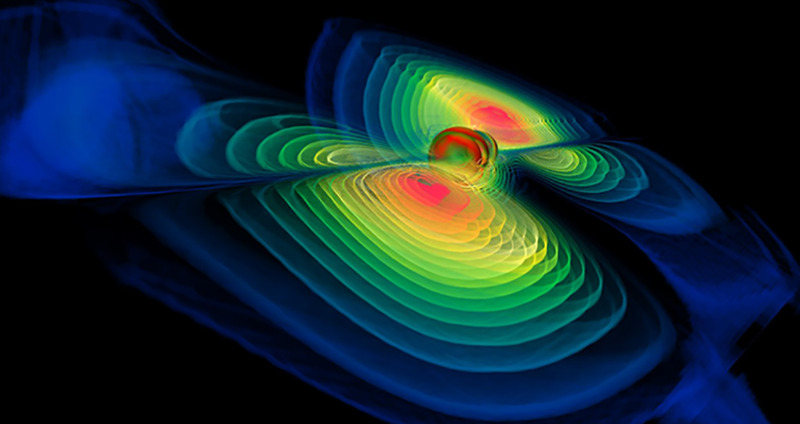 The field of gravitational wave astronomy was born Sept. 14, 2015, when the LIGO instruments made the first direct detection of a gravitational wave, which was identified as GW150914, a name that denotes the event and its date. The achievement led to the 2017 Nobel Prize in physics. The precise date of discovery was helped by a last-minute decision by UO physicist Robert Schofield and a colleague to leave LIGO detectors operating as they took time from maintenance testing to get some sleep. Through mid-January 2016, gravitational waves from three binary black hole mergers were detected. A second run after LIGO upgrades, from Nov. 30, 2016, to Aug. 25, 2017, yielded one binary neutron star merger and seven new binary black hole mergers, including the four events just reported. The new events are known as GW170729, GW170809, GW170818 and GW170823. The new gravitational waves catalog adds to the already existing mix of optical, radio, X-ray and neutrino observations, he said. “We have come a long way since the initial discovery of gravitational waves in 2015,” Frey said. The newly announced GW170729 event, detected July 29, 2017, is the most massive and distant gravitational-wave source ever observed. Its coalescence happened roughly 5 billion years ago with an equivalent energy of almost five solar masses that was converted into gravitational radiation. GW170814 was the first black hole merger measured by the three-detector network. The GW170817 event just three days later marked the first detection of a merger involving a binary neutron star system. Eleven UO co-authors, including four faculty members and six doctoral students, are listed on the new catalog research paper. Farr had a leading role in the analysis that led to the catalog. Scientific papers related to the work are being submitted to journals, but the catalog paper is posted on the LIGO website (See related links box). More than 1,200 scientists from around the world participate in the LIGO Scientific Collaboration. The Virgo collaboration has more than 300 physicists and engineers from 28 European research groups. LIGO is operated by Caltech and the Massachusetts Institute of Technology, which conceived of LIGO and led the initial and advanced LIGO projects.